People seeking more energy project siting regulations turned out in force during the legislative session. Lawmakers are bracing for the possibility that Gov. Peter Shumlin will veto an energy project siting bill that was a source of contention right up through the final hours of the legislative session earlier this month. Shumlin wouldn’t say Monday whether he will veto S. 230, a bill that is supposed to give local communities more say in the siting of wind and solar energy projects. But he said his staff is poring over the legislation’s details. The controversial legislation was hashed out after local leaders vented frustration over the state Public Service Board process for determining where wind and solar projects are built, saying communities have little to no input. A veto could bring election-year consequences if voters blame legislators for not responding to that outcry. they would call lawmakers back to Montpelier to fix it, or they would let it die. Legislators negotiated details of the bill into the final hours of the session May 6, consulting at every turn with Shumlin’s staff. Shumlin said Monday it’s “an exaggeration” to say he signed off on the bill that day. “Whenever you have major changes to legislation cobbled together in conference committees at the last minute … you always have to scrutinize what happened very carefully,” he said. House Natural Resources and Energy Committee chair Tony Klein (D-East Montpelier) said he’s heard no decisions about whether the governor will veto the bill or if the legislature would come back to alter the bill. “This is all just conjecture,” he said. In an effort to offer wind opponents some relief, lawmakers called for “temporary rules” using the procedure normally reserved for emergency rule-making to set new turbine-noise standards. 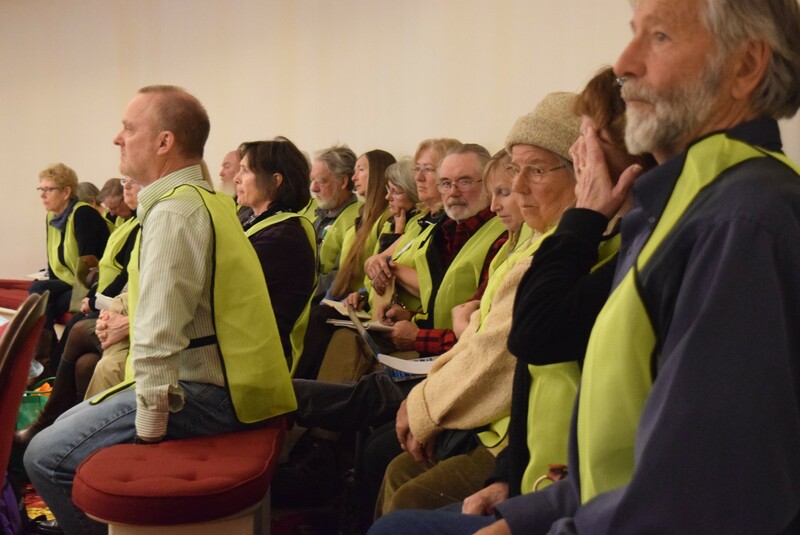 Bray said lawyers for Shumlin and the Public Service Board have expressed concerns that emergency rules may only be used when there is imminent peril — and they are wary of suggesting that turbine sound has reached that level. The bill calls for temporary noise standards that don’t exceed limits set for existing turbine projects. Lawmakers had in mind the limits set for commercial-sized wind projects such as those in Lowell and Sheffield. But Bray said the bill could require new projects to stay within limits set for a one-turbine project in Vergennes. That project, at the Northlands Job Corps campus, requires noise to be within 10 decibels of the surrounding ambient sound. Developers fear “ambient sound” measurements can vary, and that a standard based on that can be hard to meet. The bill failed to include $300,000 to help regional planning commissions train local municipal leaders on energy planning. Bray said the money was inadvertently left out as the bill changed rapidly in the final hours, but can be restored next year through the budget adjustment process. Bray said lawyers have expressed concerns about a provision requiring property records to reflect when a permit, called a certificate of public good, has been granted for an energy project on the property. The list of concerns is long enough to suggest Shumlin is building a case for veto. The Senate has set June 9 as the date to return to respond to vetoes. But the full legislature won’t return unless leaders decide to try to override a veto or pass a new bill. Bray said he’s been working to resolve the issues for the last 10 days. “I don’t know what they’re going to do,” he said. Seven Days political editor Paul Heintz contributed to this report.